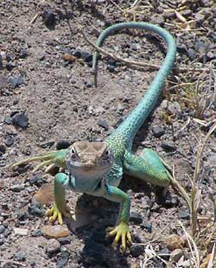 A collared lizard in Petrified Forest National Park, Arizona. Most lizards can drop their tails as a defensive maneuver. If a predator has grabbed the tail, the advantage of shedding it is clear. But tail-shedding usually results in distraction of the predator, which can be advantageous even when the predator hasn't grabbed the tail. Shedding a tail is an expensive maneuver, and can result in lower social status and competitive disadvantages. Perhaps these phenomena explain why collared lizards so rarely shed their tails. Troubled corporations sometimes engage in analogous behavior, selling off parts of themselves to raise cash. Usually we think of these maneuvers as signs of trouble, but selling a business to a competitor can do more than raise cash: it can distract the acquiring competitor as well, providing the seller with the time it might need to reconfigure itself to compete more effectively. This is yet another reason why positioning yourself in the most central parts of your company can be so advantageous. Photo by Marge Post, courtesy U.S. National Park Service. These are unusual times — few of us have ever seen anything like this. You have a job now, but you're concerned about possible layoffs, and you want to reduce the chances of being laid off. Many career strategies of long standing no longer apply. For instance, a job with room for advancement might have been attractive a year ago, but a very secure job might be more attractive now. To keep your job, when many others are losing theirs, recognize first that you aren't the only one thinking this way. Many of your colleagues are hitting Google looking for "how to avoid a layoff." Many are already applying what they've learned. We've already examined tactics for stabilizing your own frame of mind and strengthening your relationships. Here are some tips for enhancing your relationship to the organization. Normally, being irreplaceable is undesirable, because it reduces the chances of promotion. These aren't normal times. Hang on to assignments that put you in positions the organization cares most about. Strategic importance is less critical than tactical importance. If things get really bad, entire units — divisions, product lines, locations, subsidiaries — will be sold or closed. Being an irreplaceable part of one of those units won't matter. Some companies serve multiple markets. The more stable the market, the safer you are. For instance, in advertising, serving the automotive market is riskier than serving health care. Acquire any skills, knowledge, or experience that would enable you to take on some of the responsibilities of a co-worker. If you already have such skills, make certain that the right people know. These skills will enable you to take on the duties of that co-worker after the layoff. Not having them makes you more eligible for layoff than someone else who has both those skills and yours. Unless a re-assignment puts you in a more secure position, you'll be the newbie when you get there. Newbies are more vulnerable to layoffs. Any change in personnel in your upward report chain could be significant for you. When you hear of a change or potential change, learn why it might be happening and what the consequences might be. Prepare yourself. Google alerts can provide information about conditions and rumors long before any concrete events, by automatically sending you email when Google finds a hit that matches a search string you define. You can specialize to news. By setting alerts for your organization name and the names of people in your report chain, you can be tuned in to changes that might affect your position. Would you like to see your comments posted here? rbrenArSUQuiEseKzebtOner@ChacpGBYdaMbRzJgPwwmoCanyon.comSend me your comments by email, or by Web form. I offer email and telephone coaching at both corporate and individual rates. Contact Rick for details at rbrenPZtAnTwMpQpvqmaAner@ChacYfysGbCJgMLJROskoCanyon.com or (650) 787-6475, or toll-free in the continental US at (866) 378-5470.